Cortina d'Ampezzo is an attractive high-altitude town in the northern extremity of the Veneto region of Italy. It's in the Dolomites (le Dolomiti), part of the eastern half of the Italian Alps, and is a popular and well-equipped base for a full range of mountain activites. In winter the town is a busy skiing destination, with several cable cars and access to many ski runs. In the summer months the town is a good hiking centre for keen walkers, and also for energetic mountain bikers. Even if you don't fancy the rugged vie ferrate up in the rocky heights or the demanding mountain footpaths, there are still plenty of pleasant excursions using cable-cars and buses which will take you to spectacular viewpoints and mountain restaurants. 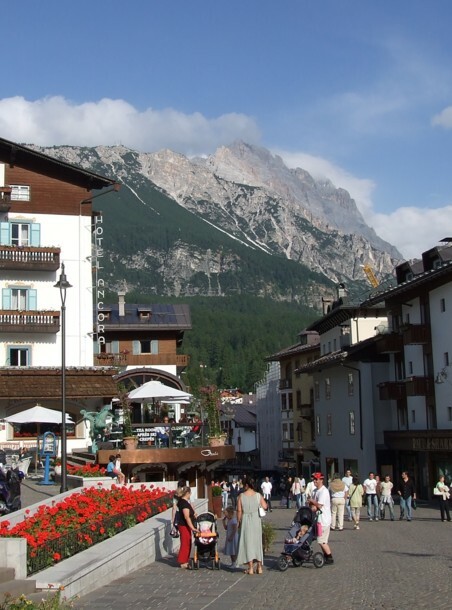 As it is in the region of the Veneto, Cortina is governed from the regional capital, Venice. However the local Comune, has been lobbying to leave the Veneto and join the neighbouring region of Trentino Alto-Adige. This mountainous area has more in common with Cortina, including a long shared history, and it is also a region with special autonomous powers. At the time of writing the Veneto regional authorities were resisting the proposals. Cortina has good transport links, whether you have a hire car or are depending on public transport. A very useful service called the Dolomitibus (more below under the heading 'Into the mountains') covers the area, with comfortable coaches linking towns. By rail. Until the 1960s Cortina had its own train station on a branch line. This narrow railway line is now a cycle path, and the former station is used as a bus station. Today the nearest railway station to Cortina is at Calalzo di Cadore, around 30km away. There's a connecting bus service. By bus from Venice and Treviso. There is a good coach service from Venice, which runs daily during peak periods, and can stop at Marco Polo Airport on request. The service also calls in at Mestre railway station and Treviso station, useful if you are flying to Treviso Airport. You should pre-book tickets from the operators ATVO. The buses run daily in high season but less frequently in quiet months - check the ATVO website (links panel on the right) for the latest dates and times. The bus leaves Venice early in the morning, and returns from Cortina in mid-afternoon. Cortina basically has two tourist seasons, winter and summer. Winter is a busy, bustling time when every facility opens and the town fills with skiers heading to or from the slopes. After the skiing stops the town shuts down, before opening up again for summer visitors. You won't find quite as much open in the summer, but this is a popular destination for walkers, climbers and cyclists, so plenty of cable-cars, chairlifts, hotels, bus services and restaurants open/run between June and September to meet their needs. The town is nice in itself, but of course its main attraction towers around: the massive summits of the Dolomites. 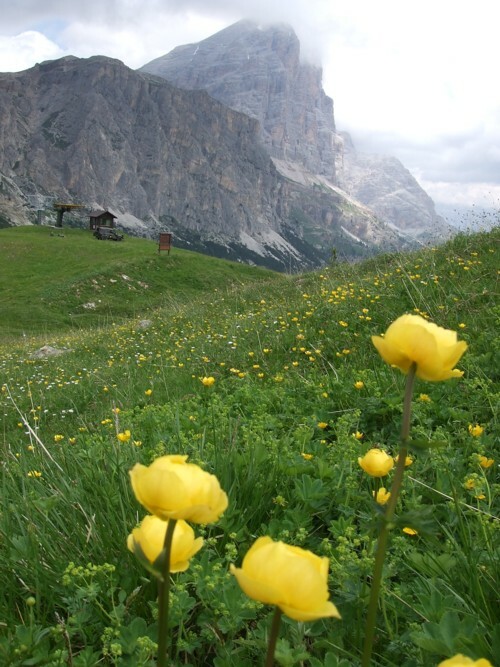 Cortina is primarily a scenic and practical base for a holiday in the mountains. To make the most of your stay, you should pay a visit to the tourist information office in Piazzetta San Francesco and pick up maps and opening times for the local cable-cars and chairlifts. Combine these with bus timetables (available at the bus station) and you'll be able to organise your stay efficiently. 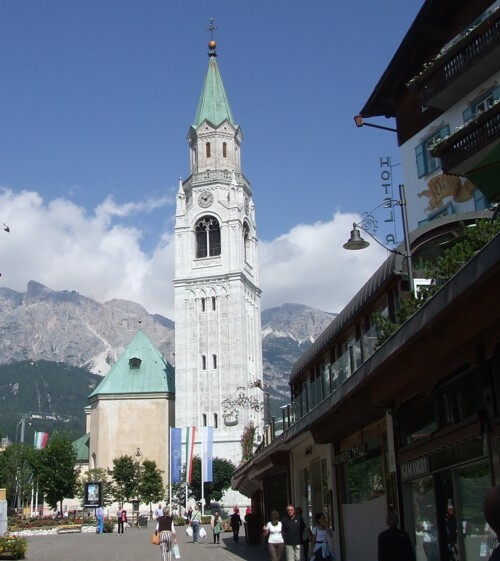 You're not in Cortina for long before you become aware of the town's proudest moment: hosting the Winter Olympics in 1956. Photographs and mementoes are dotted all around local streets and businesses. It's worth paying a visit to the Stadio del Ghiaccio (Ice Stadium), built for the Olympics and still adorned with the Olympic logo and a basin for the Olympic flame. It's open as a public skating rink. Walking out to the stadium from the centre of town you pass a little crazy golf course, which we've seen open at night under floodlights, with locals drinking at a jolly streetside bar. The eighteenth-century parish church (Chiesa parrocchiale) in the heart of town, dedicated to St. Philip and St. James, is worth a look. A whole book has been written about the campanile (belltower), which took many attempts to get right. It's the most notable landmark in the town centre, and can be admired from the pedestrianised streets and pleasant hotel terraces opposite. 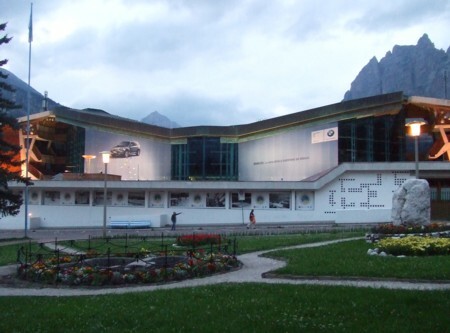 Cortina has three town museums, all housed in one building. 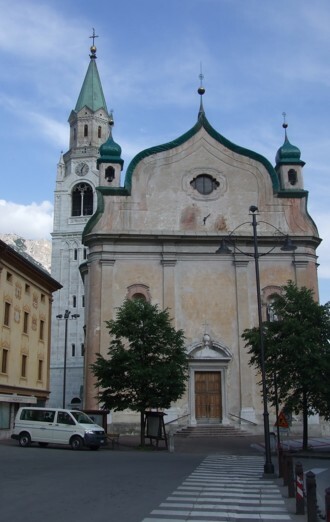 There is a modern art gallery, a palaeontological museum and a section dedicated to the historic communal administration of Cortina, the 'Regole'. More excitingly, there is an outdoor museum with three different locations in the mountains nearby, recording bitter winter campaigns fought here in the Great War. To reach these high-level areas of tunnels and displays you'll need to drive or take a bus to car-parks below, and then ascend the slopes using footpaths or cable-cars. Collect information and the latest opening times from the information office in Cortina, and remember to equip yourselves suitably for an expedition into the heights. Cortina has just about the best shop we've ever found. The town's large and historic co-operative store stocks everything you could possibly think of, as well as providing services like photocopying. Most usefully for tourists, it incorporates a supermarket to help you prepare picnics and a thorough range of excellent tourist and mountaineering guides in English. Looking around the town's other shops you'll find boutiques, mountain clothing and a large range of local crafts. Evidently many visitors drive home with elaborate wooden garden furniture and large-scale ornaments - often involving antlers - which plumb the depths of the bizarre. If you are a conoisseur of kitsch tourist souvenirs you will be overpowered in Cortina. From wolf-whistling furry marmots to fat painted pigs, you'll find all your heart could desire. If you have a car, you'll find some spectacular drives and reasonably quiet roads. There are car parks where you can leave your vehicle at the start of footpaths and by cable-cars. However, it is surprisingly straightforward to travel around the area by public transport. 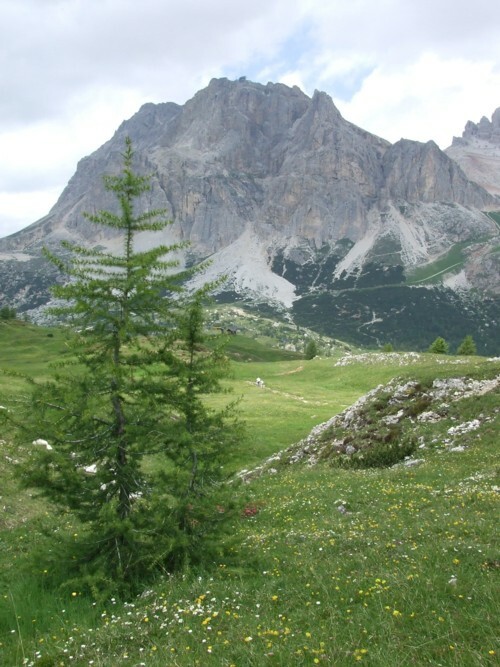 A service called the Dolomitibus connects places of interest and is aimed largely at walkers and travellers who want to get into the mountains. Equip yourself with a timetable at Cortina's bus station, buy tickets in advance at the bus station or the news kiosk nearby, and you'll be able to see most of the area this way. Typically the bus will stop by a hamlet or hotel at the foot of a cable car, and holidaymakers can alight, take the cable-car (or walk) uphill to a spectacularly-sited rifugio (mountain hostel/cafe/restaurant) where after substantial refreshments one can admire views, begin a high-altitude walk, or descend back into the valley before meeting the bus again. A few walks can be started directly from Cortina, and you can also head straight upwards in the cable-car to the Faloria rifugio. For a trip where you'll experience two very different faces of the Veneto - and of Italy - why not take advantage of the convenient connections between Cortina and Venice? The lagoon art city and the Alpine resort are just three hours apart. 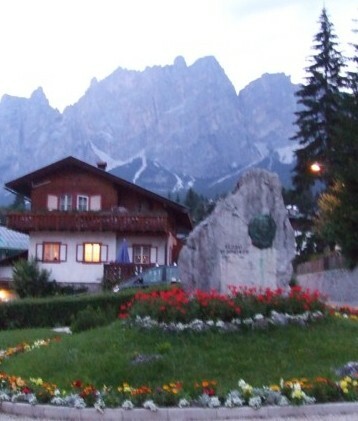 There are lots of places to stay in Cortina. Some close in summer, but most of the town's hotels are open and you can get good deals, particularly if you avoid the busy month of August.